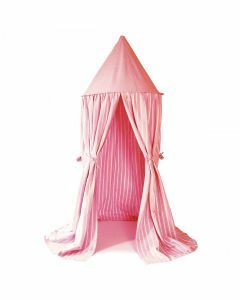 This hanging tent is great for a child's room or playroom. The bright gingham and multi-stripe Hanging tent is great to fix to a tree, a beam or a ceiling hook to create the perfect den with the minimum of fuss! Tent is made with 100% cotton and comes with rope and storage bag. Measures 7 feet high and 33" in diameter. Click on image for greater detail.